Every tea lady (or tea fanatic, as I am sometimes called) needs a pretty new teacup and saucer every once in a while. I purchased this English-made Duchess June Bouquet teacup and saucer recently on Ebay at a real bargain. It arrived in my mailbox this week. 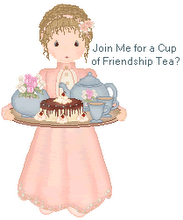 I am so happy I found it, because it matches the teapot, cream and sugar set I purchased in England in June 2008. I think I should plan a "tea for me" soon! beautiful cup and saucer. You did good on ebay!! So delicat, I just love finding things that match what I have. Very pretty! And definitely a tea for you should be scheduled the sooner the better. Beautiful! Pink roses are my favorite on teacups. Lovely! I think your tastes and mine are quite similar, so if we ever shopped together we would be reaching for the exact same pieces. Classic roses against a pale background ... how could you ever go wrong with that? What a beautiful tea cup and saucer. Yes a "tea for you" party sounds lovely!